This entry was posted in Blog, Production Updates on March 19, 2014 by '63 Boycott. 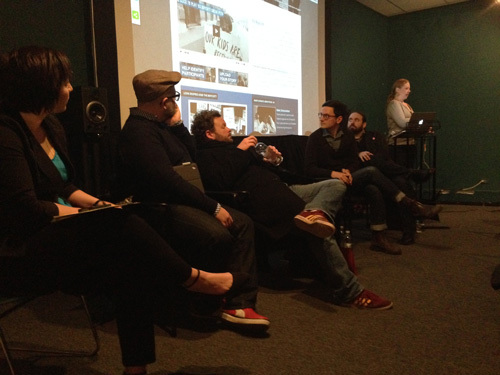 Last Saturday, March 8, 2014, Chicago Filmmakers hosted a workshop called Interactive Storytelling: Models for Film and Media Makers, and invited the ’63 Boycott team to share our experiences. Associate Producer and Outreach Coordinator Rachel Dickson shared with fellow filmmakers some of the ins and outs of launching an interactive website and outreach campaign before the film itself is finished. To date, we have received over 40,000 unique visitors to our website and over 50 boycott participants have been tagged. We were joined on the panel by Kartemquin’s Dan Rybicky, who spoke about the interactive website for his film, Almost There, and three other talented filmmakers. On Tuesday, March 11th, we presented the ’63 Boycott work in progress to the Munch and Learn group at the KAM Isaiah Israel Temple in Hyde Park. Over lunch, the group of over 30 community members asked questions, gave feedback, and shared their memories of the segregation and protests in their neighborhoods in the 60s. We were happy to be a part of the conversation. I was at KAM Temple when Dr. King spoke. It was a Wow! Do you have the speech? I would love to read it. I heard Dr. King speak at KAM Temple. His speech was one that literally changed my life. I was wondering if anyone has the speech. Dr. King came and met us at the little reception afterward-it is called an oneg shabbat.